If you feed an animal healthy, nutritious, and well-rounded diet, you’re setting your pet companion up for a longer and more active life with a reduced risk of chronic illness and disease! Our Bloomington veterinary staff is happy to offer you sound guidance on what to give (and what not to give) your animal. Puppies and kittens should probably not eat adult or "all ages" food. Puppies and kittens require relatively more protein and calories than adult and senior animals due to the rapid growth and development occurring at this life stage. Giving them food that's been specially-formulated for young animals ensures they get all the nutrients and energy they need. Nutritional needs can change based on age, overall health, and lifestyle. An older pet may not require as much food as she used to since she may not be as active. Other animals with special health needs—such as diabetes, obesity, kidney disease, or allergies—should be provided with a diet that helps manage their condition (ideally not just whatever's cheapest at the pet store). It's also essential you give animals access to clean fresh water. Dehydration can increase your pet's risk for urinary tract infections and other health problems. Be mindful of if and how you switch over your pet's food. Making quick changes to your pet's dry, canned, and/or raw food can lead to gastrointestinal upset like vomiting and diarrhea. If you are planning to give your dog or cat new food, make the switch gradually and slowly. Be mindful of if and how you give your pet "people" food. Many human foods (like garlic and raisins) are toxic to pets, plus slipping your animal snacks too often can easily lead to weight gain or undesirable begging behaviors. Ask our vet team about which foods may be okay as special treats every now and then, and how we recommend doing giving it to your pet. Bring your animal in for its routine pet wellness exam to ensure they're eating the right food for them. Our veterinary team provides many services which can help you determine what type of food (and how much of it) is right for your pet. We can run lab work and allergy testing, physical examinations, and even suggest certain supplements or prescription diets to suit their health needs and maximize their well-being. We can also advise you on when to make changes to your pet's food depending on its health and life stage. 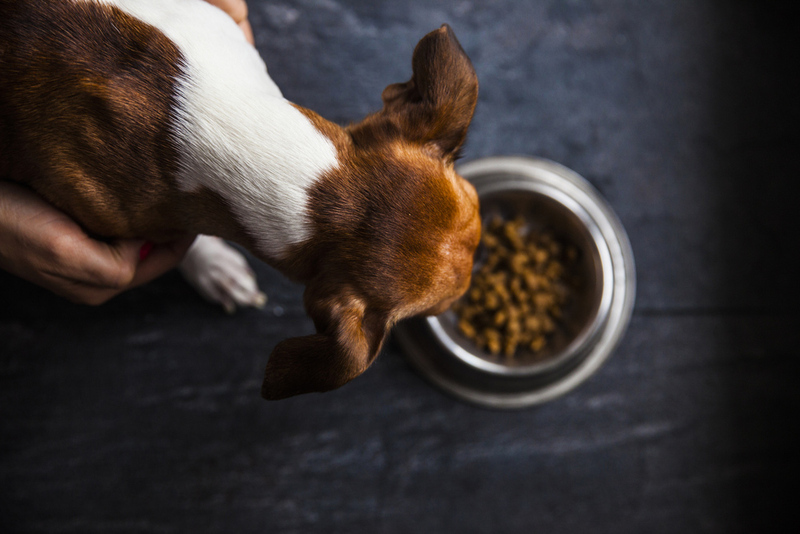 Do you have questions about feeding your pet? Contact the Fairway Knolls Veterinary Hospital today by calling 309-663-1414.